Our 8th Annual Emergency Services Food Drive is one week away!!! 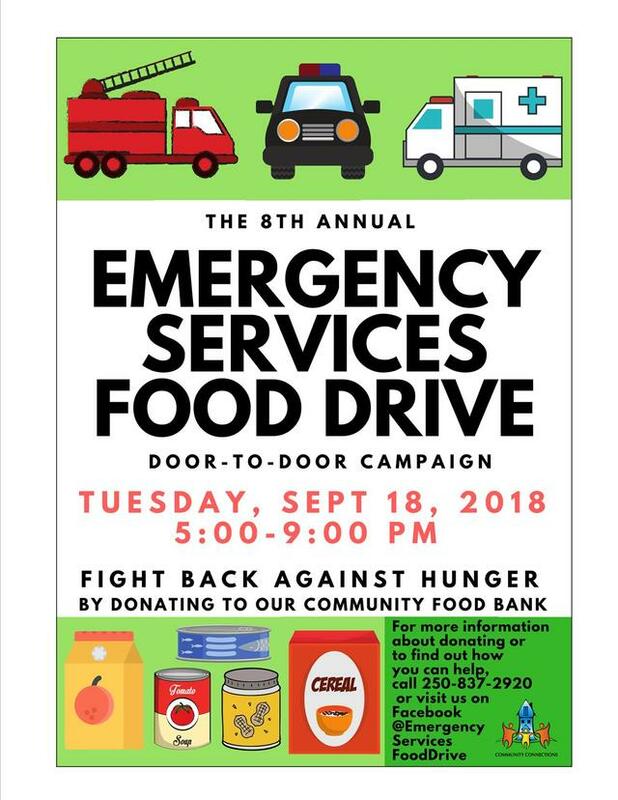 For one night only, next Tuesday September 18, emergency services crews and community groups will be heading door-to-door to seek out donations for our community Food Bank. This door-to-door campaign will serve to nourish vulnerable families and seniors throughout the year with a collection of non-perishable foods donated by our community citizens. Each year, 25% of food for the entire year is raised during this important Food Drive. Diet-related illness in the general population is on the rise and is especially the case in lower-income populations who frequent food banks. In order to prioritize healthy offerings, our Food Bank has made a “wish list” for food items that are listed below. If you will be away during the event or have missed a pickup, please drop off food donations at Save-On Foods in our donation bin or at our main office (314- Second St East) Monday to Friday during office hours. In addition to the door-to-door campaign, Save-On Foods & Southside Market accepts $2 donations at their tills- ask a cashier to add it to your grocery bill to help the cause. Listen for the sirens, raid your cupboards, and give food to help feed those in need! Note: In order to increase healthy donations, we prefer items with five or fewer ingredients, items with low or no salt and sugar, and no junk food. We cannot accept home canned products or items that have been partially used.